LAREDO, TX — Former LA Lakers legend, Magic Johnson, has been named the guest speaker at the 2014 Laredo STARS Extravaganza to be held on Thusday Sept. 11, 2014 at the Laredo Country Club located at 1415 Country Club Dr. in Laredo, TX . Over the years the STARS program has enlisted the help of international figures from politicians to actors. This year basketball superstar Magic Johnson has been added to the list. 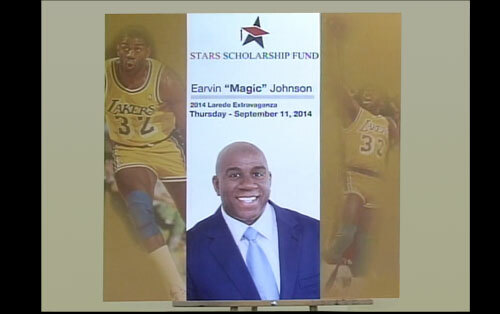 Magic Johnson named featured speaker at the 2014 Laredo STARS scholarship fundraiser. “We think it’s going to be a great extravaganza. He’s a passionate speaker, he’s passionate about sports and he’s passionate about his fellow man and he was especially interested in doing this, because it benefits the community,” said Steve Lamantia, founder of STARS (South Texas Academic Rising Scholars). Source: KGNS.TV. Over the years STARS has given out close to $24 million in scholarships to help send more local kids to college. This year the fund hopes to give out an additional two-point-five million to South Texas students. Magic Johnson is a retired forward for the Los Angeles Lakers who led his team to five NBA titles. He was part of the Olympic Dream Team in 1992 and was inducted into the Basketball HOF in 2002. ESPN’s Sports Century ranked Johnson #17 in their 50 Greatest Athletes of the 20th Century. In 2006, ESPN rated Johnson the greatest point guard of all time. In March 2012, Johnson was part of an investment group that won the bid to own the Los Angeles Dodgers. He has become one of the most powerful African-American businessman in the world.